What a fascinating site!. It has everything that interests me: information on cameras (particularly vintage cameras); articles on famous photographers; photography tutorials etc. And not just a few things. It’s packed with material on photography and cameras. It uses video extensively and I can spend large amounts of time just watching the various videos. As far as my interests are concerned this is arguably the best photography-related site I’ve come across. I’m glad I found it. Ted Forbes is a photographer, media producer and film maker. He currently works as Media Producer at the Dallas Museum of Art. In addition he is also an adjunct faculty member at Brookhaven College. Born in Dallas, TX, Ted began making photographs at an early age taking cues from his father, illustrator Bart Forbes, as well as other major influences who he came knew at an early age such as Greg Booth, Jack Unruh, Brad Holland, CF Payne and many others. Having actually gone into music in high school, Ted attended the prestigious Booker T Washington High School for the Performing and Visual Arts followed by earning his music degree from the University of North Texas in 1997. Shortly after he took a media position at iSong in the height of the 90′s tech boom. This led to pursuits in multimedia and web based coding languages. Having gone back to briefly to “fill in some holes”, Forbes began freelancing as a media designer. Around this time, he also began to get serious again about his early passion of photography. 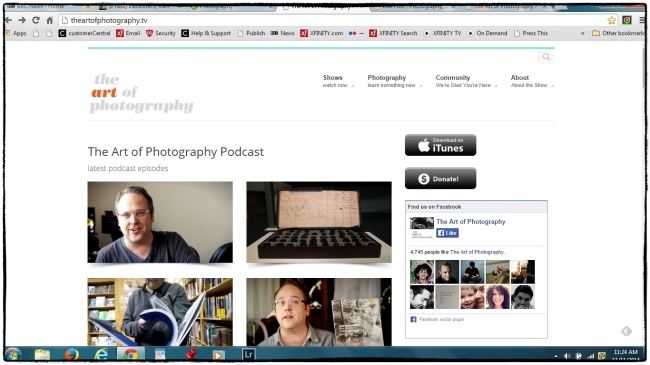 Ted started the Art of Photography in October of 2008 as an experiment that’s grown into one of the most popular podcasts on iTunes. via The Art of Photography Podcast. This entry was posted in Cameras, Photographers, Photography. Bookmark the permalink.